Jake Johnson in Win It All. 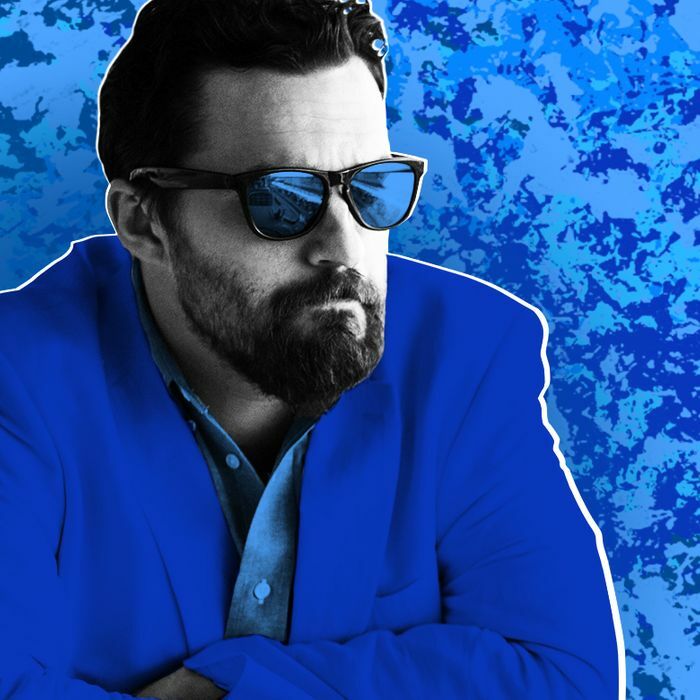 After Jake Johnson finished his first season of New Girl, he was very tired. When Johnson got cast in the pilot as Nick Miller, a barely competent law-school applicant turned bartender, he was a gigging actor shuttling between indies like Max Winkler’s Ceremony and studio comedies like Get Him to the Greek. He assumed that the job would be six days of work for a nice paycheck, plus the opportunity to work with talented folks like Liz Meriwether, Jake Kasdan, and Zooey Deschanel; he didn’t expect an episode two, much less six seasons (and counting). And when the pilot got picked up, Johnson made a crucial mistake: He treated it like a film, which lasts 90 to 120 minutes, rather than a network television show, which lasts, in the case of New Girl’s first season, 24 separate episodes. After eight months of working 16-hour days, with co-star Max Greenfield constantly reminding him that they could be doing New Girl for years to come, the last thing Johnson wanted to fill his free time with was another job. He thought he’d hang out with his wife and friends, listen to the Grateful Dead. Maybe plant a garden. And then he met Joe Swanberg. At that time, Swanberg was known as one of the impresarios behind mumblecore, a genre that either brought independent filmmaking into the real world of struggling young adults, or produced a whole mess of movies in which nothing happens, depending on whom you ask. Johnson had never heard of mumblecore and never seen any of Swanberg’s films, but his friend Lizzy Caplan was supposed to be in the next one, so he agreed to meet with him. Swanberg outlined to Johnson what making the film would be like: They’d have nine-hour shooting days, improvise, drink beer on set, and if he was tired, his character could be tired. Most of all, it would be fun. Johnson’s first indication that Swanberg was not the hustler he appeared came during preproduction. After he met with Swanberg, he and Caplan decided they didn’t like the structure, and they outlined a new version, which they sent to the director. They were shocked when he said, sure, they could make the movie that way. Caplan had to drop out, but by this point, Johnson was in, and he watched in amazement as Olivia Wilde, Anna Kendrick, and Ron Livingston came on. Miraculously, they had a movie. That movie, 2013’s Drinking Buddies, turned out to be an improbably good film. Like the best work of Jay and Mark Duplass, its shaggy, shambling tone belies a razor-sharp, emotionally sophisticated portrait of people struggling to balance their own desires with those of their partners and friends. Most of all, it takes the naturalism of mumblecore and gives it a shape, texture, and level of professionalism. Johnson had a terrific time making it, and he went back to New Girl energized, with the intention to work with the director again. Fast-forward half a decade, and Johnson’s now on his third movie with Swanberg, Win It All, which debuts on Netflix Friday. Like their previous collaboration, Digging for Fire, Johnson also co-wrote and co-produced the film; unlike that movie, a largely improvised ensemble piece, Win It All is a drum-tight, straightforward character study about a guy who’s addicted to losing. Aside from showcasing the best Johnson performance since Drinking Buddies, Win It All reintroduces the actor as a savvy, thoughtful storyteller with a knack for both the intricate details of adult life and the effective beats of genre filmmaking. In Win It All, Johnson plays Eddie Garrett, a guy whose desperate desire to be liked is only outweighed by his uncontrollable need to gamble; the tension of the film comes from which side of his personality will win out. After a gangster gives him money to watch over while he’s in prison, Garrett compulsively gambles it away. He tries to earn the money back through legitimate means, which leads to a solid job working for the landscaping company of his brother, played by Joe Lo Truglio; a blossoming relationship with a nurse and single mother, played by Aislinn Derbez; the mentorship of his sponsor, played by Keegan-Michael Key; and a general increase in his quality of life. But when the gangster gets out early, Garrett must — you guessed it — win all the money back, or else watch the adult life that he’s painstakingly built come crumbling down around him. What results is a funny, absorbing, and surprisingly tender film — about the joys of adult life as well as the constant struggle of an addict — made for less than a million dollars, with 25-year-old women just out of art school designing the sets, a first-time DP, and an overall model of talent and hunger over experience. If movies like California Split and other classics of New Hollywood confronted the futility and violence of masculine expression, Win It All eagerly provides an alternative, not to mention a different kind of protagonist than the type we see so often in contemporary indie film. “When Digging came out, I started getting really bored with this idea of the man-boy slacker blah blah blah — I was just hearing it too much, it was too much a part of the conversation and the work I was doing,” Johnson says. “I don’t have a lot of thoughts about man-boys. I’ve been working basically nonstop for a decade, I have kids, I have a mortgage.” That’s mirrored in his character: Eddie is a grown man who simply wants to do better, and once he proves that he’s sincere, those around him want to help. Johnson actually received some tutelage on the subject from an unlikely source: Tom Cruise, his co-star on this year’s The Mummy. He says he was reluctant to commit to the film at first — for one, he was afraid that he might literally die trying to keep up with the star — but the possibility of working with Cruise and director Alex Kurtzman eventually convinced him to sign on, even though it meant months of training. One day during the shoot, Johnson watched Cruise insist that the camera actually catch them riding down and exiting a helicopter, a far more difficult version of the shot than if they’d just used an edit point when the helicopter landed. Besides giving Johnson the opportunity to work with people like Cruise, the actor’s work in blockbusters allows him to support his wife and 3-year-old twin daughters while he and Swanberg keep financing movies on the side. Still, he finds that most of the scripts need work, and executives hem and haw when he suggests fixes. That kind of grief just leads him back to making films with Swanberg, even though it means sacrificing Cruise’s jet for a van in Chicago where he’s sitting on a PA’s lap. But, he says, if he can get “one one-hundredth” of the people watching The Mummy to check out Win It All on Netflix, then it’s a victory, too. Meanwhile, Johnson and Swanberg are already planning their next film together. It’s going to be bigger and more expensive, with more story and greater risks, and they’ll co-finance it with the proceeds from Win It All. Like their protagonist, they’re putting the winnings back into the pot, and they’ll keep going until they bust.